Have you come across the phrase "intentional community," but didn't really understand what it meant? Dancing Rabbit Ecovillage resident Ma'ikwe Schaub Ludwig provides an insiders look at what it means to live in such a community. Note: the following is a guest post from Ma’ikwe Schaub Ludwig, a resident at Dancing Rabbit Ecovillage. Intentional Community is the radical notion that how we live ought to be based on our values. Strange that this is “radical” but the truth is, many people struggle to integrate their values into their daily lives, and intentional community provides a rare forum to be able to live, well… intentionally! An Intentional Community is a group of people who are working together for a common goal, and the term usually applies to groups who live together. Commune, cohousing, ecovillage, housing coop and shared house are all kinds of intentional communities. I’ve lived in community for 16 years, and the biggest blessing of choosing this lifestyle is that everything in my life works together: my work, my food, my child rearing, my free time, my ecological practices and personal growth are all found together and feed into each other in a holistic way. Communities serve as social laboratories of sort: we are actively experimenting with societally relevant things like peaceful conflict resolution (because boy, do we bump into conflict when we live together!) 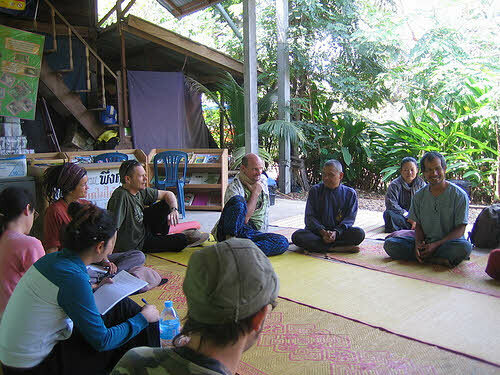 direct democracy, natural building, resource sharing and ecological sustainability. The solutions developed in community are hands-on, practical and grass roots at their best. In North America, the organization that serves as an umbrella group for cooperative living organizations (basically playing with anyone who wants to cooperate more, regardless of the specific form it takes) is the Fellowship for Intentional Community. Through publications– such as the Communities Directory (both in book and web form) and Communities magazine– annual events gathering like minded people together, and online resources such as Community Bookshelf and a process consultant directory, the FIC is all about supporting the vibrancy and spread of community in the world. And given that most people in both the US and the UK say they want more of a sense of community in their lives, it is fortunate that someone is looking out for just that. The FIC is currently raising money to build a new national headquarters in the innovative sustainability community of Dancing Rabbit Ecovillage. Come check out the project and how you can help FIC spread the word more effectively through getting this critical need met. Ma’ikwe Schaub Ludwig is the author of Passion as Big as a Planet, and a regular contributor to Communities magazine. She serves on the oversight board for FIC, and the board of directors for Dancing Rabbit Ecovillage (which is also her home) and teaches a variety of workshops about sustainable community living and healthy group process. Check her work out here or find her on facebook. Next article Will Dissolving Rock in the Ocean Stop Climate Change?